I never really cared for beets until I stumbled upon a lasagna recipe with roasted beets and an herbed béchamel sauce a few years back. I absolutely had to make it as my curiosity overwhelmed my otherwise lukewarm feelings about these vibrantly colored roots. It turned out to be (at the time) the best vegetarian lasagna I had ever eaten. Thus my beet craze began. I'm pretty sure I made that lasagna twice more in the month or two that followed, and I also started ordering beets at any restaurant that offered them on the menu. There is this pub in Chicago that serves really good British food. You know, the stereotypical stuff: fish and chips, bangers and mash, scotch eggs, bubble and squeak. But though they have their staples, the rest of their menu is ever changing with the seasons. On one serendipitous occasion, I happened to order their roasted beets. It was tossed in an amazing pistachio vinaigrette and topped with a dollop of ricotta. I was through the moon, it was so good. 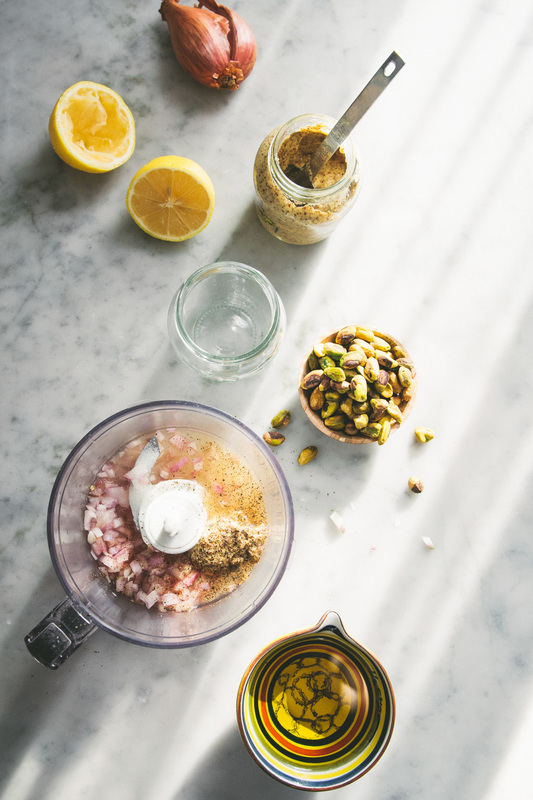 I craved those beets constantly, but in the spirit of being frugal, I wasn't going to eat out every time I wanted them, so I went in search of a pistachio vinaigrette recipe that hopefully came close to the original. I remembered it was tart, slightly sweet, and slightly onion-y, with small flecks of pistachio throughout. A few different taste tests later and I had something I was happy with. Let me tell you though, unfortunately (or fortunately depending on your viewpoint) those beets found their way onto everything. I put them on couscous, on salads, ate them as a side to fish, or alone as a snack. Eventually I must have experienced beet overload because fast forward a year later and the only place those beets would be found were in the recesses of my memories. But then I suddenly thought about them a few weeks ago, and to the farmer's market I went. Serves 4 to 6 as a starter. Preheat oven to 400 degrees F. Trim the greens off the beets and give them a quick rinse to remove any dirt. Place beets in a large baking pan, add 1/2 cup water, cover with foil and place in oven. Roast 45 to 55 minutes until cooked through—you should be able to easily pierce the flesh with a paring knife. Let cool to room temperature. While the beets are roasting, make the vinaigrette. Place chopped shallot in a food processor and pulse until minced. Add lemon juice, champagne vinegar, mustard, sugar, salt, and pepper. Pulse a few more times until well incorporated. Drizzle in olive oil and keep pulsing until combined. Transfer mixture to a liquid measuring cup or small mixing bowl. Add ground pistachios and whisk to combine. Once cool, peel the beets and slice them to your preference (rounds, wedges, cubes, doesn't really matter). Transfer to a mixing bowl, add a generous sprinkle of salt and 1/2 cup of the vinaigrette. Gently toss to combine, cover, and refrigerate for 30 minutes to let the flavors meld. To serve, place beets on a bed of mixed greens (optional), drizzle some more vinaigrette on top, and sprinkle with additional pistachio if desired.